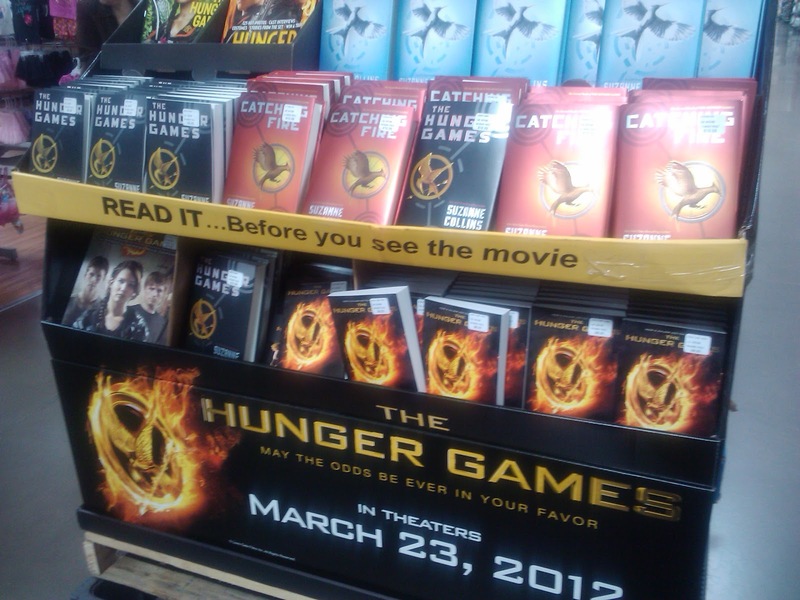 A couple of weeks ago I had no idea what "The Hunger Games" was all about. Now I'm as Katniss- and Peeta-crazy as any 14-year-old. I got the opportunity to review the book a couple of weeks ago and just this past Friday (March 23) I went to see the movie. ...print out your ticket from your computer...and take it with you to the theater. Easy, right? Definitely. BUT, as is typical with me, while I was running out the door to the theater Friday morning, I forgot to bring my ticket with me. Not at all. If you do happen to forget your ticket, you can just print out another one at the Fandango kiosk in your theater...just make sure you have the credit card you paid for the ticket with on you...that's all you'll need. I arrived at the theater about 20 minutes before showtime...and I was kind of surprised that I was one of only a handful of people there. It was just 10:00 am, but after seeing the lines for the midnight show, and with a number of schools in the area having spring break, I was a little nervous that the show would be packed. The people who were there were there were of all ages...people in their 60s or 70s, those in their 20s and some in their 30s and 40s. That was pretty refreshing, actually...I knew this was a story geared toward young adults, but it was obviously reaching across age lines. To be honest, I wasn't sure what to expect when the movie started. I have seen plenty of movies that were based on books, and some have fallen completely flat. It has been my opinion that it's just too hard to express through live action what can be written and imagined. 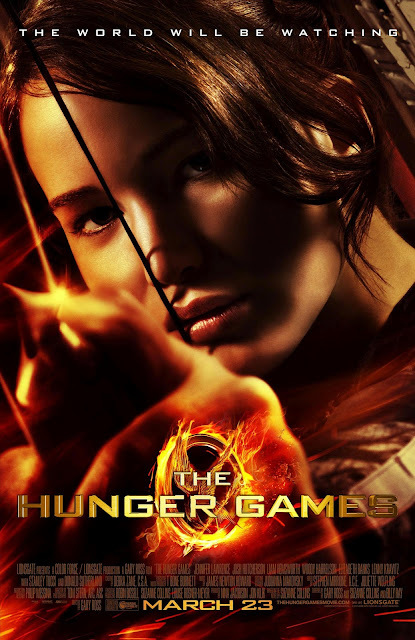 BUT, I was pleasantly surprised with "The Hunger Games." From the opening scene, I think Gary Ross (the movie's director) captured the feel of Panem (the country in which the story takes place) and it's districts exactly the way I imagined them. The feel of the movie was dark, and lonely and depressing...and the background music was dirge-like. The entire movie felt cold and damp...and I felt myself wrapping my arms around my shoulders to keep warm. Yes, it was that convincing. During the first part of the movie, before the training for The Games begins, you rarely see any color at all in the scenes...everything is gray, black, white and the green of the forest. But as Peeta and Katniss are brought to the capitol to begin their preparations I was instantly reminded of Dorothy entering Oz...everything became bright and colorful. It was cool and sort of spooky...especially since the Capitol is such a strange, hedonistic place. The main characters, Katniss (played by Jennifer Lawrence), Gale (Liam Hemsworth) and Peeta (Josh Hutcherson) were cast wonderfully and believably. And the supporting cast, Elizabeth Banks (Effie Trinket), Woody Harrelson (Haymitch), and Donald Sutherland (President Snow) among others, did a fantastic job. I especially enjoyed Woody Harrelson. In the book, the character of Haymitch was hard for me to picture. I understood who he was and what he was doing, but I never really "got" him. Woody Harrelson really brought the character to life and made him actually likable as the tributes' mentor in The Games. I would have liked to have seen the characters' personalities and stories developed a little more, but I understand that there are time constraints when making a movie. Especially one that is trying to capture the focus and attention of all age groups. But the end result is characters that fall a touch flat. For example, in the book, Katniss is a deeply conflicted young girl who is trying to save herself and her family. She struggles internally with doing what is right while keeping herself alive. This is something that can't be accurately portrayed through the movie, and, unfortunately, Katniss seems to be just full of teen angst. The major events in the book are portrayed really well in the movie, and there are very few things that are left out. Time passes much more quickly in the movie, and there is almost a feeling of being rushed through The Games, but even if you haven't read the book, I believe you can get an accurate idea of what the author (Suzanne Collins) was trying to say. Haven't read the book? I definitely recommend doing so before seeing the movie. Although I think the movie stands on it's own well enough to be thoroughly enjoyed, I also think you will get much more out of it if you know the back stories, thoughts & emotions of the characters a little more in depth. Don't have any idea of what The Hunger Games is about? Didn't know it was made into a movie? Now I'm halfway through the second book (Catching Fire) in the trilogy. I'm really enjoying it so far...and I hope it proves to be as good as the first story in the series. I think I am going to see the movie this week sometime with some friends... I have not read the books at all but after your review a looking a little more forward to the movie! thanks Mags!